The way commercial contracts are supported is evolving, and business expectations are moving fast. In-house legal teams are embracing the need for new ways of working, but it’s not easy to benchmark where your performance is today, find out what everyone else is doing and identify how, and where, to start focusing on improvements. 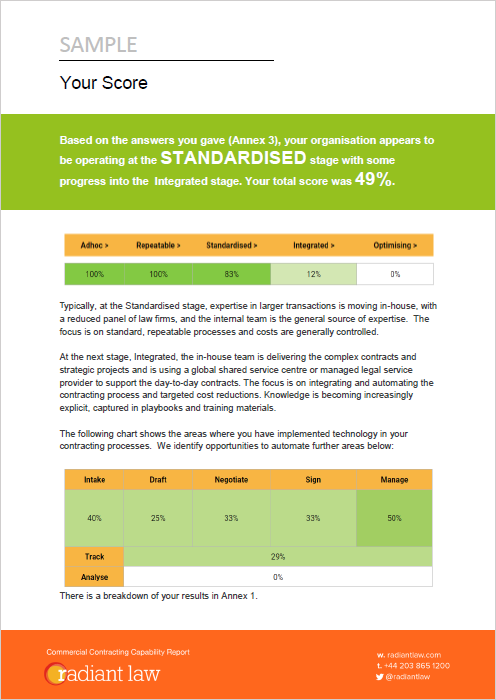 To help in-house teams understand how their peers are working and where their company is on the journey to optimal performance, Radiant Law has released this free benchmarking tool*, based on our Contracting Capability Maturity Model. We've written more about why we developed the tool, and why we're making it available for free, on LinkedIn here. Fill in the simple multiple choice questions below and we will send you a free tailored report showing you where you are compared to other companies and recommended next steps based on your answers. And we would be delighted to have a free and confidential strategy follow-up call to talk through the results and next steps. "They bring a fresh approach and offer innovative and new ideas. They are real visionaries."